What can you get for $20 at Nordstrom Rack? Hautelook and Nordstrom Rack are now among my happy places! Of course I’ll always be loyal to Ross, but it’s always nice to find new options when you’re shopping on a budget! Last week was the clear the rack sale, meaning you get an extra 25% off clearance! I went there only to return a pair of shoes I had gotten from Hautelook, wasn’t planning on buying anything, but I had to at least look around, right?! 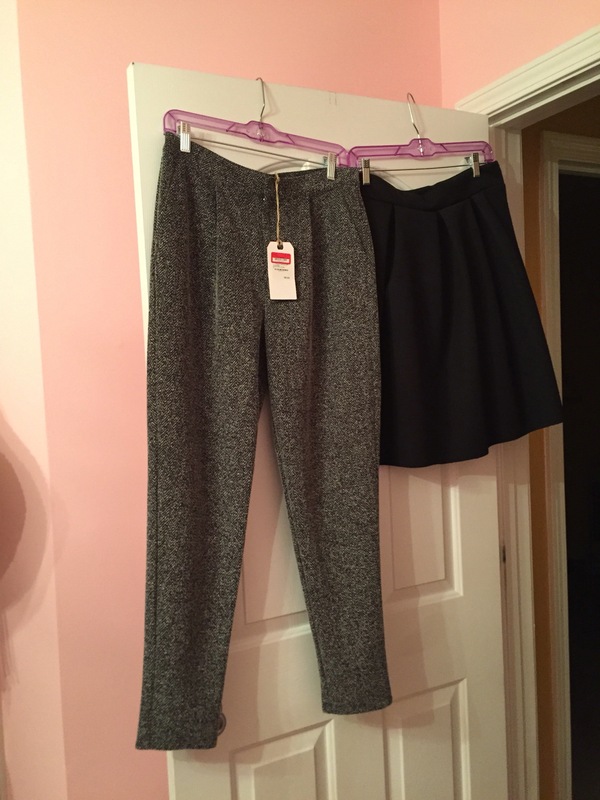 I found a super cute pair of tweed pants and a black skirt for a total of $20! It would have been wrong to leave them there! The skirt was actually cheaper than it was marked, I could have done a backflip when the cashier said it was only $6! Also, the pants were just labeled small, so I wasn’t sure if they would fit since I haven’t fit anything in a small on the bottom half in years!!!! But hooray they fit perfectly!!! I’ve already worn them both! New clothes don’t last long in my closet because I get so excited about them! Sometimes an ugly print is super cute!